You are currently browsing the Gluten Free For Good blog archives for January, 2009. People with celiac disease often have secondary issues with dairy products. That’s a long and convoluted story, but I’ve had some trouble with dairy in the past, so for the most part I avoid it. For information on milk and a basic glossary, check here for a past post I did on the subject. Last Saturday I attended a membership gathering of the Raw Milk Association of Colorado and the local chapter of the Weston A. Price Foundation. Pete Kennedy, lawyer and VP for the Farm to Consumer Legal Defense Fund was the keynote speaker and did a presentation on raw milk trends and food politics. (I’m such a geek, I absolutely love this stuff.) David Lynch, founder and director of Guidestone, a non-profit dedicated to sustainable development and conserving regional agricultural resources, gave a historical perspective of how the raw milk movement has taken hold in Colorado and the legal aspects of buying and consuming it. David also owns Cottonwood Creek Dairy, which provides local folks in the Arkansas Valley of central Colorado an opportunity to share in the joys of raw milk from his Jersey milking herd. Dianne, a friend of mine from the holistic nutrition world did a short presentation on the benefits CLA (conjugated linoleic acid) in meat and milk from 100% grass fed animals. Not only were the speakers good, the local product exhibits were great as well. It was a day of nourishing food, good information, lively conversation, and food politics. I learned more about local grass-roots organizations that promote healthy living, sustainability, and ethical food production, which is something I’m very interested in. Meg and Arden, owners of Windsor Dairy, sold me on trying some raw cheese from their certified organic dairy farm (I bought two types seen in the photo above). Both Meg and Arden are veterinarians and together have developed a system of dairy farming suited to Colorado’s altitude and growing conditions. They have cows derived from Brown Swiss and Tartentaise breeds from the Alps — perfect for our climate (not that I know anything at all about dairy cows). Arden gave me a quick info session on why some people with celiac disease and a casein intolerance might do okay on raw milk and cheese. He’s a vet and I don’t have a “regular” doctor, so I decided to take Arden’s advice and give it a try, starting with the most mouth watering cheese you’ve ever tasted. Here’s how I used their Nakhu cheese, which is a medium flavored raw cheese, reminiscent of traditional farmhouse English Cheddar. And that’s from a Swiss cow in the Colorado Rockies. A delightful taste of cultural diversity, wouldn’t you agree? • Brown the sausage in a small amount of oil, drain and set aside. 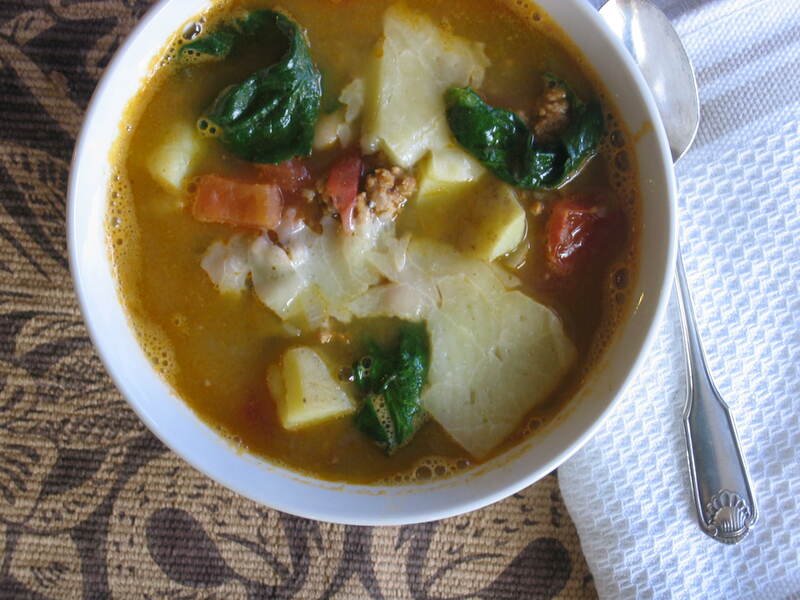 • Using a heavy soup pot, heat a glug of olive oil and brown the onion over medium-low heat until soft. • Add garlic to the onion mix and sauté for a few minutes, stirring often. • Add the potatoes, some salt and pepper, stir and sauté for a few more minutes (3 to 5). • Add the sausage and the chicken broth, bring soup almost to a boil, reduce heat and simmer for 45 minute or so. • Add beans, spinach, and tomato about 10 minutes before serving. • Salt and pepper as needed. I added slices of the raw Nakhu cheese after I served it into the bowls. Let it melt a little bit and enjoy. 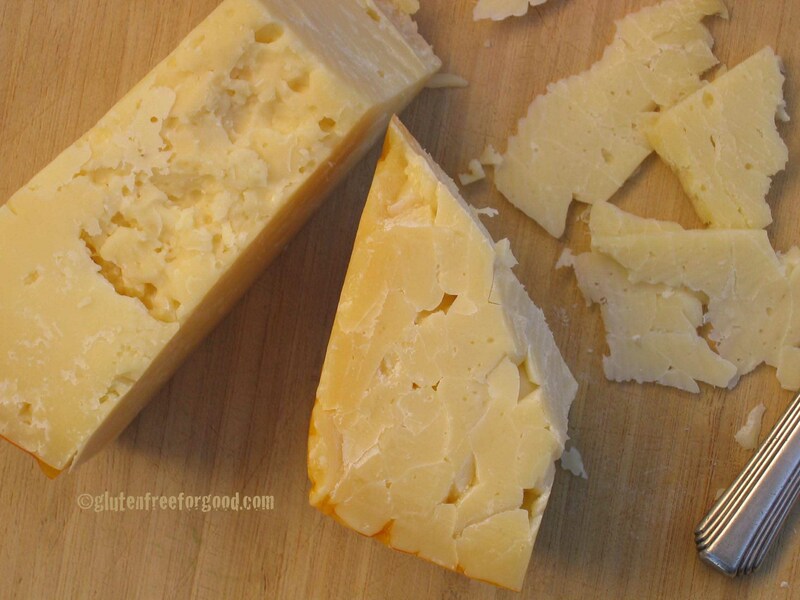 If you don’t have access to raw cheese from a nearby dairy farm, grated parmesan would be nice. I’ll let you know how I do with my reintroduction of dairy products. Maybe sticking with raw, unpasteurized, organic cheeses and milk will be okay. Arden, my new vet, might be right. I’m keeping my fingers crossed. Did your grandmother ever tell you that fish was brain food? Once again, grandma was right. About 60% of your brain (mine too) is made up of fat — essential fatty acids (EFA). In fact, some evolutionary biologists attribute the fact that humans are at the top of the food chain to one specific food. That food is fish, which is full of healthy EFAs (the good fats). I’ll give you a brief run-down of what EFAs are, how they enhance our health, and where you can get them, but first, just for fun, please check out this post on EFAs. It will give you a little background and a humorous take on omega fats and why we need them to survive, thrive, and carry on. It will also enlighten you as to one of the reasons men are attracted to J-Lo. 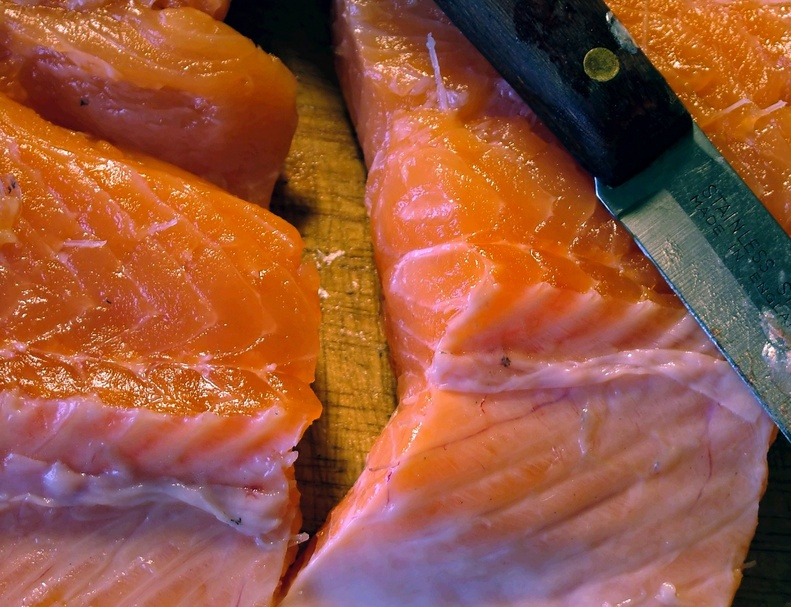 * Omega-3s fall into two categories — plant-based and fish-based. You also get omega-3s from 100% grass-fed meat. While the plant-based sources are healthy additions to the diet for many reasons, EPA and DHA derived from fish and meat are more bio-available. The body has to convert the shorter chain fatty acid, ALA (alpha-linolenic acid) from the plant source, into EPA and DHA and studies show we aren’t very efficient in doing so. Fish appears to be the the best source. * There are some conditions in which these oils may have a negative impact on the body, so it is important to consult your doctor before taking EFAs in the form of supplements. It is also important to avoid low-quality fish oil supplements as they may contain some icky stuff (heavy metals, toxins, etc.). 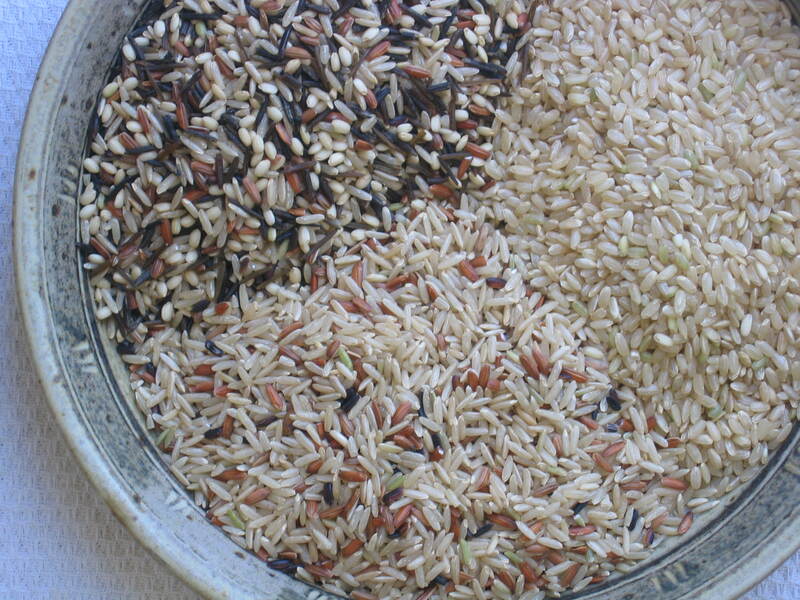 Serve with yukon gold roasted potatoes or wild rice. Yum! So, the bottom line is — ladies, celebrate your curves, and men, if we call you a fat head, take it as a compliment. Is this pup cute, or what?! Seriously, have you ever seen a more adorable face? I don’t think so. This is my guy, Fairbanks. Actually, this is his “before” picture. See below for his “after” picture (after adding over 100 pounds). First cute, then handsome — what a guy. Fairbanks is an Alaskan Malamute, a breed evolved as freighting dogs among the native Alaskan Eskimos, the Mahlemut tribe (hence the name). Because of the harsh winter conditions, these people depended on the dogs for their very survival. 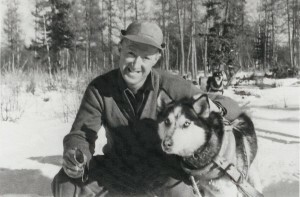 As hunting partners, they were able to help take down large game, often located far from home, and then haul it back over the frozen tundra. They had to be strong, powerful and able to withstand long days of hard work in frigid temperatures with little fuel. These dogs aren’t built for speed, they’re built for stamina and endurance. Their efficient metabolisms require far less food than you’d expect from an animal this big. 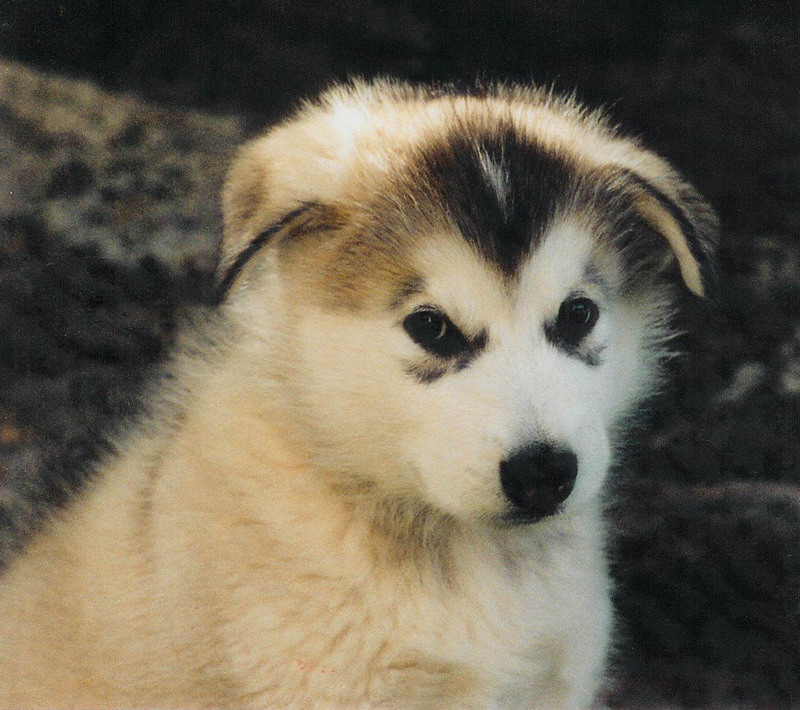 Descendant from the northern wolf, Malamutes are rugged dogs who thrive on hard work. 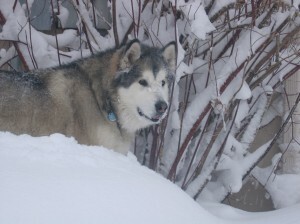 In 1984 at the Winter Ski and Sports Show in Portland, Oregon, a big Malamute named Mack pulled record weights of 3570 pounds on snow and 6900 pounds on wheels. 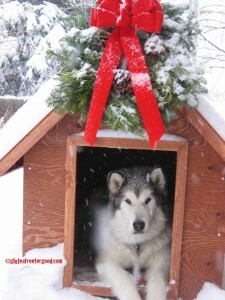 You can understand how the native Eskimos needed these dogs to survive. Hauling a caribou back home over harsh terrain for days on end couldn’t be done without them. 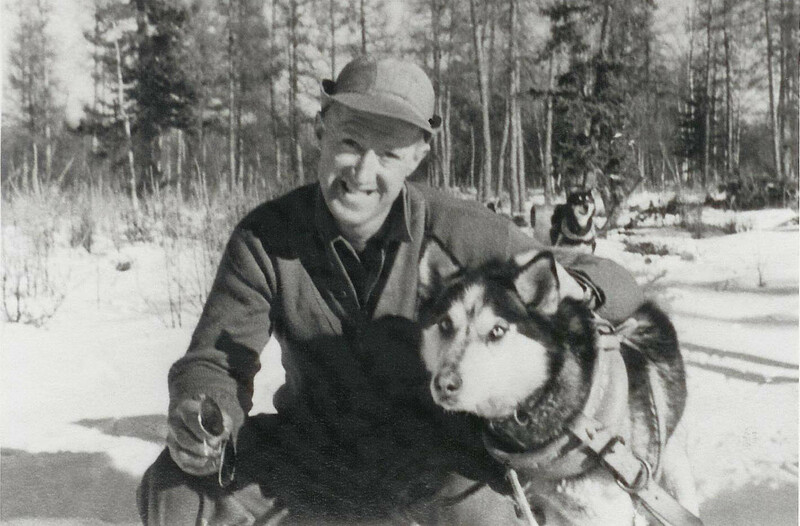 Having said that, Fairbanks prefers hanging out, doing his dog thing, going for his daily walk, and enjoying a rather cushy life compared to his ancestors. He does sleep outside though and had no problem with our recent record cold nights (19 below zero). It’s where he wants to be, but he does have a well-built dog house with a nice fleecy bed inside. Aaah, and he deserves it. Okay on to the food part. My last post with the companion dog doing his job (sleeping while officially off-duty) inspired me to do this one. I’m always ranting about people food (what to eat, what not to eat, what to eat in moderation — blah, blah, blah). I decided I needed to do a “what NOT to feed your dog” post. 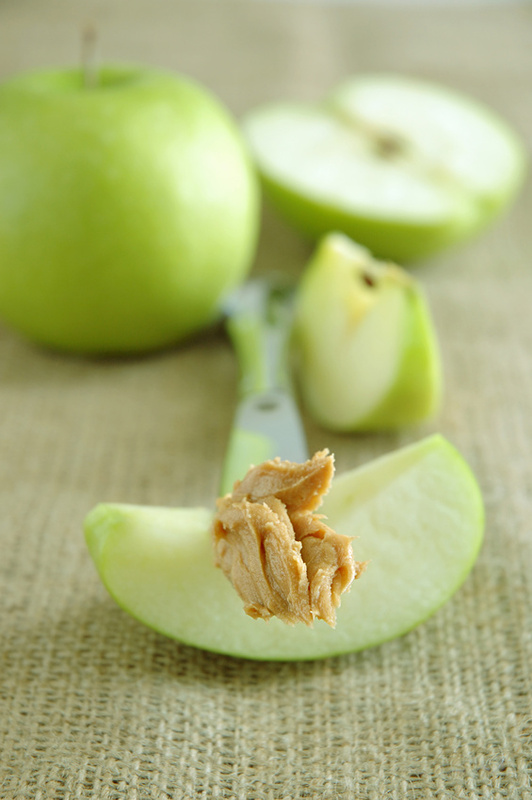 Some of these foods might surprise you. I tried to get Fairbanks to eat a grape one time and he gummed it up and spit it out, hilariously so. I had no idea grapes were toxic to dogs. Yikes! Thank goodness he did. He’s not only handsome, he’s smart. The following information came directly from my vet. Some of these foods are so toxic to dogs, they not only endanger their health, they may cause death. Good treats for dogs are baked potatoes and green beans (see, I told you Fairbanks had a cushy life). He also has a taste for wild-caught salmon. Go forth and scratch some tummies! P.S. Check out Liz and Henry for another food and dog blogger. 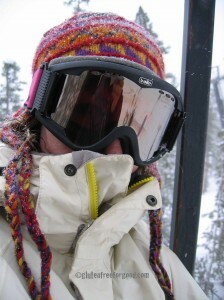 I took these photos at the base of Winter Park Ski Area in the mountains of Colorado. No thought went into it, no positioning myself for optimal light, no effort to get the right angle. I had my little point and shoot camera in my jacket pocket and as I was taking my skis off to go inside and eat lunch, I saw this wonderful dog on duty. 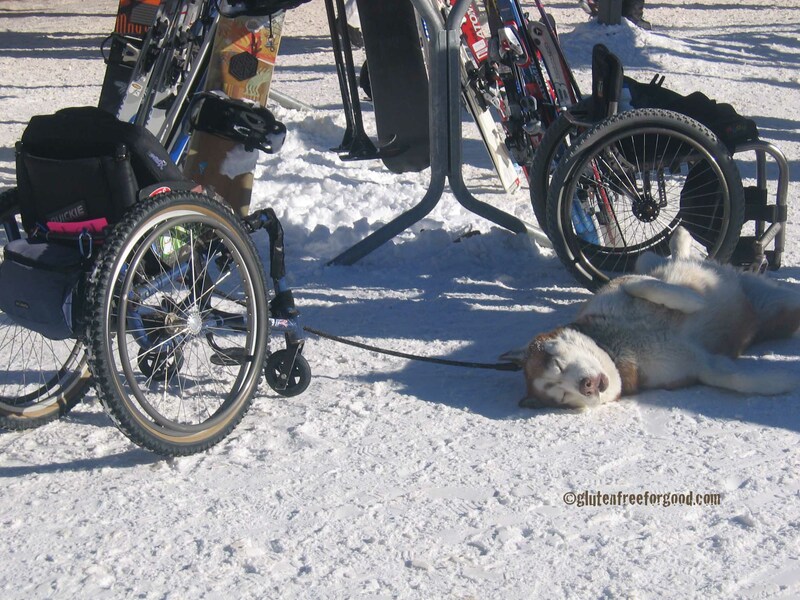 Although he was doing his dog job, he was also taking full measure of the fact that his owner was off tearing up the slopes and he could take a break and relax in the sunshine. Whoever owns this dog skis at Winter Park and if his (or her) wheelchair is any indication, he (or she) is out and about regardless of what some might call a “limitation.” Winter Park is home to the National Sports Center for the Disabled and is known internationally for the caliber and dedication of its athletes and participants. That includes the hundreds of volunteers who are committed to helping people with disabilities learn to ski, snowboard, snowshoe, climb and enjoy the outdoors. The program also includes the Disabled Competition Center and the NSCD Alpine Ski Team. The Competition Program has placed dozens of racers on the U.S. Disabled Ski Team. At the 2006 Paralympics in Turin, Italy, NSCD worked and trained 16 of the athletes who were representing the USDST. Miles from England and Xenny from South Africa inspired me to do this post (although they don’t know it). Long story, but Xenny is an amputee and plays on the beaches in South Africa. When I saw a photo of “Xenny’s Beach” on Miles’ blog and read how newly installed stairs gave Xenny access to the beach, it made me smile and think of my own stomping grounds. 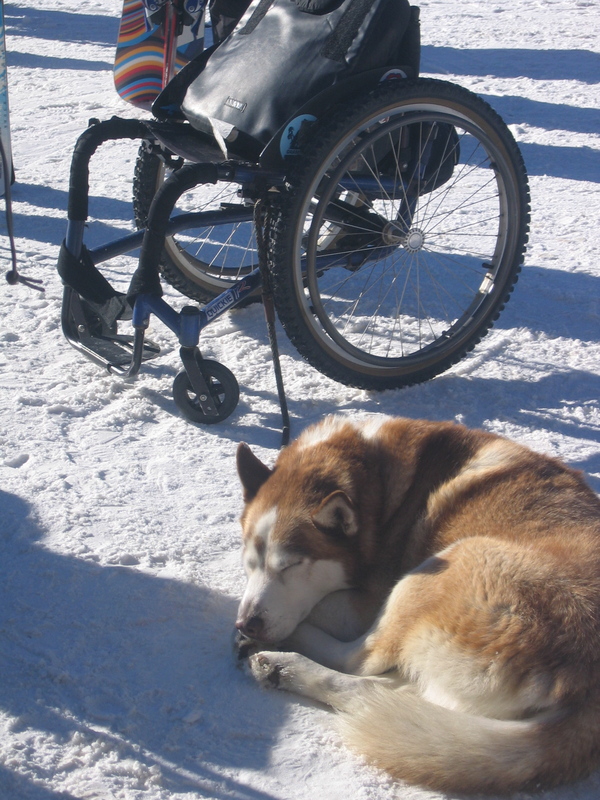 I’ve spent my life skiing at Winter Park (and Mary Jane) and the base area is home to wheelchairs, artificial limbs, and the occasional dog companion. The scene always inspires me. Do you ever talk yourself out of doing something because you think it will be too much effort? Convince yourself you don’t quite feel good enough? No real reason, you just can’t seem to muster up what it takes to get off your bum and go move about? We all do that on occasion. I did it yesterday and skipped one of my favorite yoga classes because I was — lazy? Imagine what it must take for this guy (or girl) to get up skiing. Or the access needed for Xenny to get to the beach and have fun. I’m grateful to have these folks around for inspiration and I thank them from the bottom of my whiny (occasionally) little heart. If you need more inspiration in the coming year to celebrate life and movement, check out this video of one of my all-time yoga heros, Matthew Sanford. Go forth and play. No excuses! Beware, as I’m going to launch into all kinds of healthy living posts for 2009, but I’ve decided to hold off until the holiday weekend is officially over. It’s hard enough to think in terms of starting in on New Year’s resolutions, no point in doing it prematurely. Not that I made any to begin with. I believe it’s better to have “intentions” rather than deal with full-on resolutions. This recipe has become one of my favorite party food staples. Hot, spicy and easy (indecent little things), these poppers are always a huge hit. Sorry I don’t have a picture of the finished product, but I’m not one to take food pictures while I have guests waiting to be served. I normally make about 25 or 30 poppers at a time and use 2 blocks of cream cheese and 2 packages of bacon. * It’s fun to play popper roulette and leave some seeds in one of them. Just one, and don’t identify it. The seeds make it MUCH hotter. Snicker, snicker. You can either put them on a baking sheet and place in a 425-450 degree oven for about 10 to 15 minutes until the bacon is fully cooked, or put them on a skewer and cook them out on the grill. I always grill them, as I like the taste and I can usually get someone else to “man” the grill. P.S. 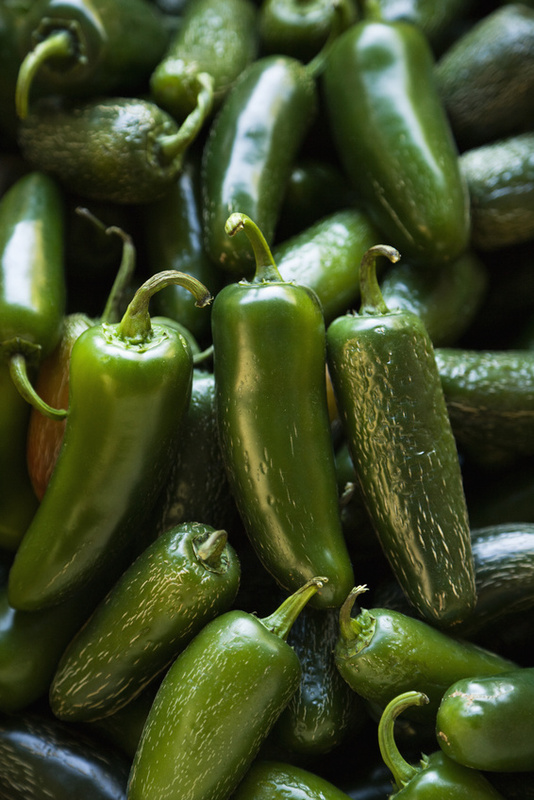 If you’re having a party, take your shower before you handle hot jalapeño peppers. Wash your hands thoroughly and don’t rub your eyes, touch your lips, or any other delicate parts of your body. YIKES! Just trust me — be very careful as the bite of the capsaicin is very hard to wash off and can linger for hours. Go forth and pop some jalapeños! Rather than obsess about health, resolutions, clean living, nutrition, exercise, or food, I’m just going to send you my warmest wishes from colorful Colorado. There will be enough time for all the other stuff later. Thank you, everyone. It’s been a good year, despite this mean spirited economy. I appreciate your comments, support, good humor and knowledge and am grateful to all of you for being such an important part of my little blogging world. Here’s to a happy, healthy, and adventure-filled new year.